Background: Tuberculosis (TB) is a deadly infectious disease caused by the pathogen Mycobacterium tuberculosis (Mtb). Approximately, 1.8 and 1.3 million people are infected and die, from TB each year as estimated by the World Health Organization. Due to increase in the incidence of drug-resistant strains of Mtb, there is an urgent need to accelerate research which focuses on the development of new drugs with novel mechanism of action that can treat both drugsensitive and resistant TB infections. 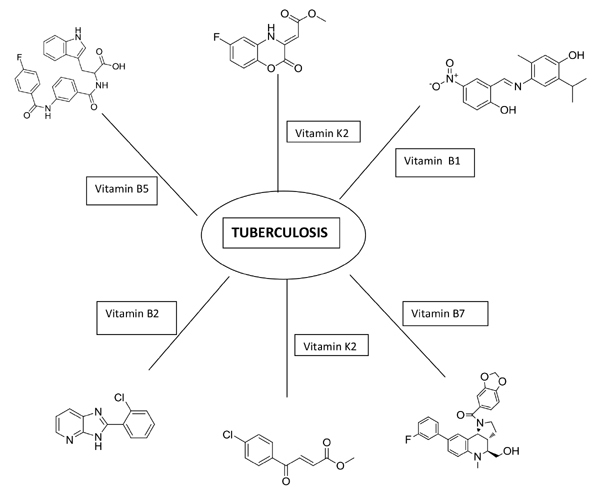 Objective: The purpose of this review study was to describe vitamins as drug target that can be explored to develop new anti tubercular drugs that can treat both drug-sensitive and resistant TB infections. Method: The methodological approaches include literature review which is performed in the databases like PubMed, Web of Science, Scopus, Springer and Science Direct, etc. On the basis of evaluation of literature sources, the review was complied. Results: This review study demonstrated that vitamins biosynthesis pathway could be used in the development of novel drug targets. Further sequencing of the Mtb genome facilitated research in target identification and validation that make possible the discovery of novel anti-TB agent with new mechanisms of action. Several compounds were identified, which target vitamin biosynthesis pathway /enzymes. Some other new targets were also identified and can be explored for the identification of novel structural moiety. Conclusion: Further exploration of these compounds which have been identified to target these vitamins related novel target pathways /molecules could led to the development of antitubercular drug which can be used in the treatment of drug sensitive and resistant TB. Keywords: Isoniazid, Mycobacterium tuberculosis, pyrazinamide, tuberculosis, vitamins, novel targets. Affiliation:National Institute of Pharmaceutical Education and Research, Shree Bhawani Paper Mill Road, ITI Compound, Raebareli 229010, U.P., National Institute of Pharmaceutical Education and Research, Shree Bhawani Paper Mill Road, ITI Compound, Raebareli 229010, U.P., National Institute of Pharmaceutical Education and Research, Shree Bhawani Paper Mill Road, ITI Compound, Raebareli 229010, U.P. Keywords:Isoniazid, Mycobacterium tuberculosis, pyrazinamide, tuberculosis, vitamins, novel targets. Abstract:Background: Tuberculosis (TB) is a deadly infectious disease caused by the pathogen Mycobacterium tuberculosis (Mtb). Approximately, 1.8 and 1.3 million people are infected and die, from TB each year as estimated by the World Health Organization. Due to increase in the incidence of drug-resistant strains of Mtb, there is an urgent need to accelerate research which focuses on the development of new drugs with novel mechanism of action that can treat both drugsensitive and resistant TB infections.